Are you a fan of watermelon and feta? I have to confess: I’ve never had a watermelon feta salad. I have no idea what people are talking about when they describe it’s deliciousness. 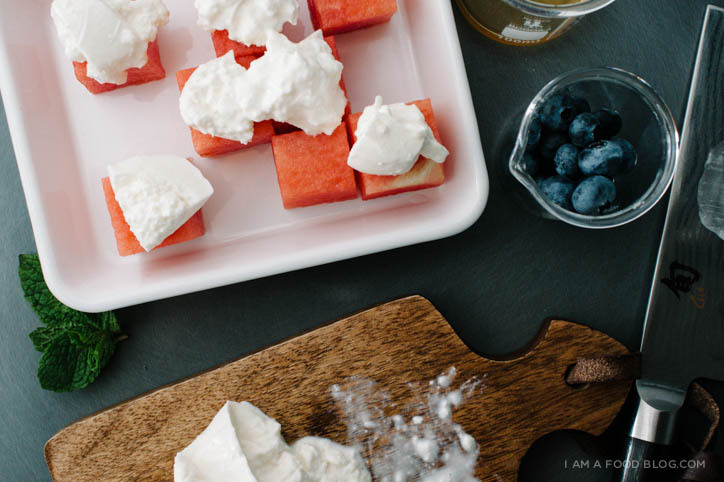 It’s not that I have anything against watermelon and feta (although, it’s true, I’m not a huge fan of feta), it’s just that I’ve never felt the need to try it. Let’s face it, if I’m out and I have to choose between french fries or a salad (even a salad with fruit in it), I’m choosing the french fries. Speaking of choosing, how do you choose your watermelon? It always seems a mystery to me. My mom’s method is to pick up each melon and smack it lightly. I have no idea what kind of sound she’s looking for, but generally she seems to choose wisely. She’s not entirely foolproof though, so I’m pretty sure it’s a fluke when she ends up with a super-sweet melon. Nonetheless, I tend to do exactly the same things as my mom: give it a thump to see if it sounds “hollow,” see if it’s deceptively heavy, and give it a thump or two to hear how it sounds. The other day, tiny melons were on sale at the store so I finally decided to try a cheese and watermelon salad. I didn’t want to use feta, so I went with my favourite cheese: burrata. 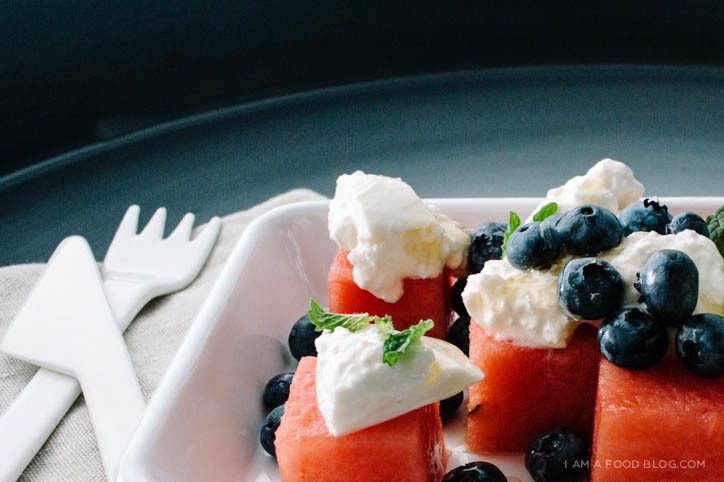 The mild creaminess perfectly compliments the sweetness of watermelon. The blueberries added a touch of tart (they’re not exactly in season right now) and the mint and honey pulled the whole thing together. This salad is as simple as it gets — it doesn’t even have a dressing, just a simple drizzle of honey. The lack of bells and whistles means that the produce really shines, so try your best to choose your watermelon carefully. 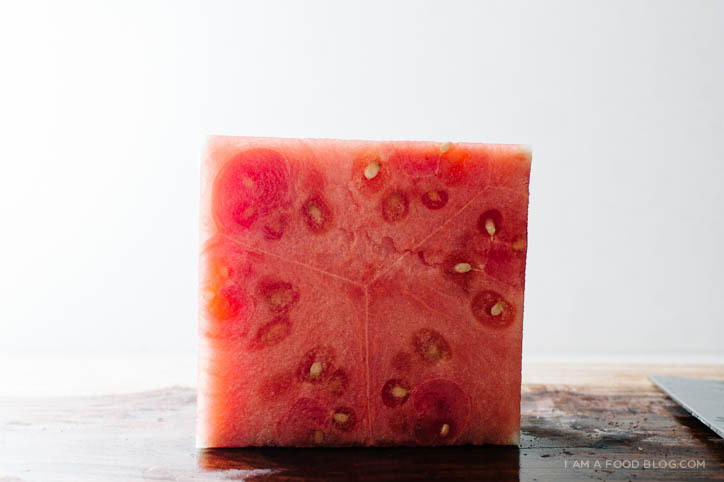 Watermelon is like one of those perfectly wrapped presents. Their outsides are a gorgeous stripped green and you’re pretty sure you’re going to love what’s inside, but really, until you unwrap (cut into) it, you never know if it’s exactly what you wished for. I like my melons to be sweet and juicy with crisp, firm flesh. Nothing makes me sadder than a soggy melon or one that’s too pulpy. I also like really red watermelons. I’m sure their color has nothing to do with flavor, but the redder the melon, the tastier it seems. Divide the watermelon cubes equally between two plates. Gently tear the burrata into pieces and divide equally. 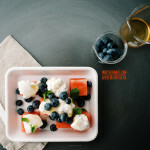 Dot with blueberries and mint leaves. Drizzle with honey to taste and enjoy. 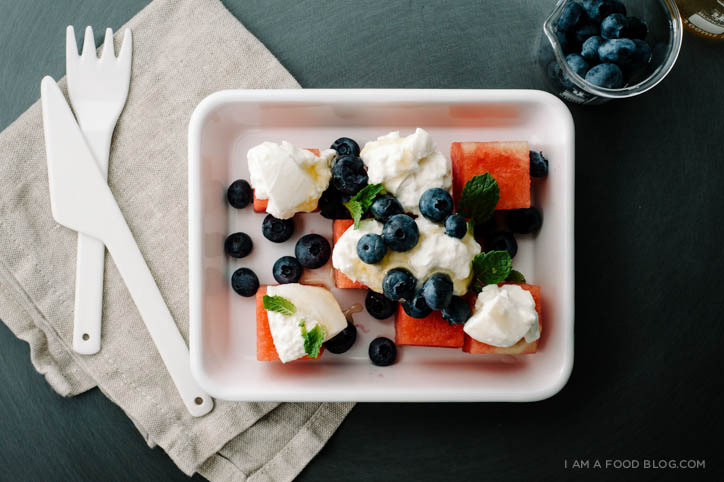 I haven’t tried watermelon and feta together either, but I love the idea! This sounds fabulous together too. Burrata is a true love of mine. Yes, burrata is a true love of mine too! Mmm that cucumber watermelon salad looks awesome! And of course Izy’s photography makes it that much more mouthwatering. I don’t usually do anything with watermelon except eat it, but I love fruit with cheese so I figured, why not? i’m not a feta person either! 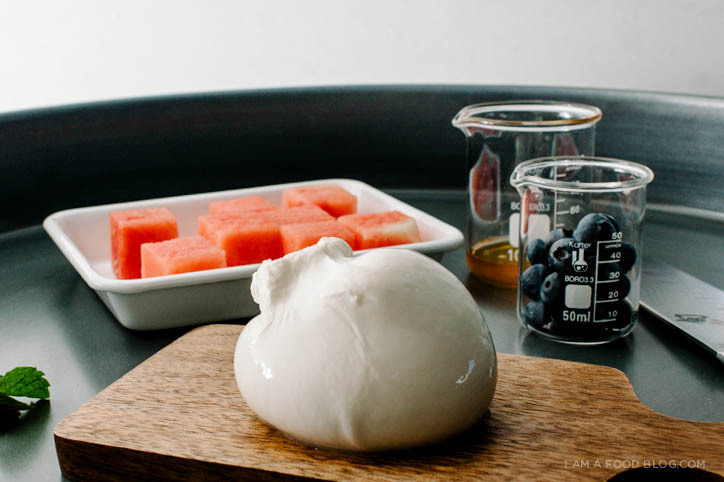 and that plop of burrata is just too cute. i’m into this. i am so excited for watermelon season!!! yay! watermelon season is when i can straight up just eat watermelon for dinner. it’s the. best. season! I learned how to pick watermelon a couple years ago! You want to pick the ones that are heavy for their size that look like they’ve had time to grow, meaning the part that’s been resting on the ground is all craggly and yellow. And look for ones where the end that had the vine growing out of it is really tiny, because it means the vine had time to shrivel up. I’m sure I look funny at the market, inspecting the watermelons and picking them up. 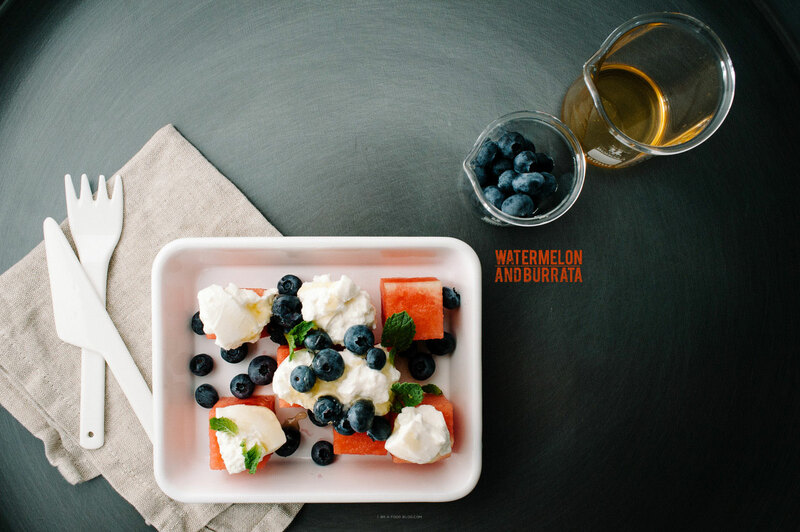 And I don’t get all the hype over watermelon feta salads – burrata sounds waaay better!! floppy hats for the win! This salad looks so fresh and I can’t wait to start eating watermelon on warm summer days. And is that a beaker filled with blueberries? What a salad! Will definitely remember this in summer!! Girl, you’re pure inspiration. My Uncle grows fields of watermelons in North Florida. I’ll try this in a few months with one I pick myself. i like the touch of honey. Glad to have found you through the weekly bloglovin feature. Just discovered your blog through MomofukuFor2! (I was looking up recipes to make bacon dash). And, OH HAI, FELLOW VANCOUVERITE HERE! Just a question, where do you get your burrata in Vancouver? I was at Hawksworth 2 weekends ago and tried burrata for the very first time and I LOVED IT! Is Granville Island a good place to scour for good cheeses? Looks delicious, can’t wait to try. Roll on summer eh?